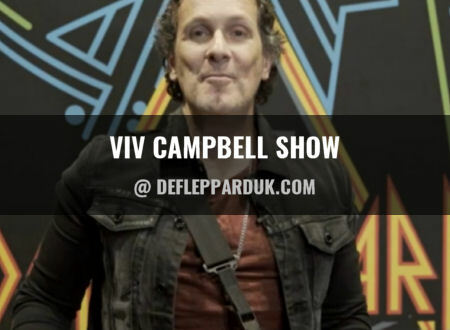 Def Leppard guitarist Vivian Campbell hosted the final edition of his new rock show last night on Radio Ulster. This week's show included songs by The Vapors, Def Leppard and U2. Vivian's fourth show featured 11 songs. The full playlist is shown below and a full transcript. The show is available for 29 days on the BBC iPlayer. "Turning Japanese by The Vapors and I'm playing that to you because this show is coming all the way from Zimbabwe. Er no. I'm in Japan of course. I'm Vivian Campbell and welcome to what is sadly, for me at least, the final show in this series of ill advised shows. I have thoroughly thoroughly enjoyed the experience of making these shows for you. I hope that you've somewhat enjoyed listening to them too." "I'm in Japan to play some shows with Def Leppard as our world tour moves through Japan, Australia and New Zealand and then on to Ireland and UK. Hopefully we'll be seeing some of you when we play in Dublin and Belfast in early December." "When we get to Australia next week these chaps will be sharing the bill with us and I'm very very much looking forward to that." "That was Scorpions with Lovedrive. It was the title track to their 1979 album and indeed the very very first song that I ever heard from the Scorpions. And I actually, I found that record while browsing through the racks of Caroline Records which was. I think it was down on Anne Street in Belfast and the thing that fascinated my teenage mind and drew me to that was actually the album cover if you remember those. It's amazing how we actually. We'd take a chance on a totally unknown record based solely upon the cover. Not so much nowadays I guess. And those of you who are familiar with that album cover will understand a teenage boys attraction. Enough said." "When we leave Australia and New Zealand we'll say goodbye to Scorpions and we will say hello to these very very very lovely people." "Hello There Cheap Trick from their 1978 album Live At Budokan or Bu-do-kun as the locals here would say in Japan. And we're actually playing there tomorrow night. Fancy that yeah. It's a fabulous and famous old venue here in Tokyo and we've played here many many times before over the years and unlike us it never gets old." "Cheap Trick as I mentioned will be sharing the bill with Def Leppard at our December shows. But looking beyond December I just got a phone call today from a grown up to tell me that we actually just announced today that we're going to be playing the Download Festival next June with Def Leppard so we're most excited about that and I think that's a jolly good reason to play this. "That was Def Leppard with Bringin' On The Heartbreak from the 1981 album High 'n' Dry. A song that was written by the late and great Steve Clark. Indeed Steve's all to early passing in 1991 led to my joining the band a year later in '92." "And who indeed amongst us knows where it is that life is gonna lead us but speaking of journeys I started this whole series with some songs and albums and artists that first inspired my personal musical journey. And it was mostly an Irish collection of artists that originally motivated me. Artists like the Horslips and Rory Gallagher, Thin Lizzy, Gary Moore and so on. And so to sign off with this final show I'm gonna try and keep it mostly Irish from here on in this week." "Now when Bringin' On the Heartbreak was released in 1981 I was still living in Norn Iron and playing with Sweet Savage. And one afternoon we got a call from the Queen's University Students Union asking if we could do an emergency show if you like. So they wanted someone to fill in an opening slot for a band that was coming up from Dublin. And always keen to work and always keen to seen to be helpful we obliged." "I Will Follow by a young Dublin band name of U2. Now when Sweet Savage took the stage top open for them at Queen's Students Union there was zero fanfare and when we finished our performance there was less than zero if that's possible. Ouch!. To say the least among U2's audience we were not at all welcome. We were a lot more akin to this." "That was The Rocker by Thin Lizzy. A track that originally featured fellow Belfast guitarist Eric Bell. But tonight I played you the version of off the Live And Dangerous album that featured Brian Robertson and Scott Gorham on guitars. And that was the version of the song that I first heard. In fact when I was doing my stunt guitar duty with Thin Lizzy back in 2011 I was always trying to get the lads to play that one for one of the encore songs. It's a really exciting riff. It's a lot of fun to play as a guitar player. But Brian Downey and Scott Gorham weren't always too keen to play it however. But I didn't let that stop me from launching into it on a couple of occasions and they had no choice but to follow 'cause it starts with a guitar riff. So if you're listening Brian and Scott I'm really kind of sorry but I'm not really if you know what I mean." "A change of pace there and a song from a great great band from Cork named Rubyhorse. That was a song called Any Day Now from an album called Rise. That record came out in 2002 and about that time Rubyhorse played a series of shows opening for Def Leppard in the United States. And I very quickly became a big big fan of the band. Now I have no idea if the band are still together or not. But if they're not they should be if you know what I mean. So lads if you're listening please pick up the phone call each other and get it back together. And in any event speaking of Cork." "Rory Gallagher and Souped-Up Ford from the 1975 album Against The Grain. That was another big big record on my personal learning curve. Although I never did get anywhere close to mastering slide guitar to Rory's level. Very veru far from it in fact. He was a real master of that." Both Cork and Ballyshannon in County Donegal lay claim to Rory and if I remember correctly he was born in Ballyshannon but he was raised in Cork. If I don't have that right please send a postcard. I don't care where you send it just send it somewhere." "Now I would doubt that any of you will have ever of heard this next song before. This is yet another, I know it goes on, another wee project that I got myself involved with back in the late 1990s. I was still very much a part of Def Leppard at the time but Leppard took a lot of time off back then and I would always find a way to keep myself busy one way or another. So I had a bit of time on my hands. I ended up making a record with some friends of mine. Drummer Mark Schulman, bassist Sasha Krivstov and a very very very talented singer/songwriter from Dublin name of P.J. Smith. And although we recorded this in the 1990s it actually wouldn't be released until about 2006 where after it very very quickly withered on the vine if you know what I mean. From the album Through Time this is Clock What's Wrong With You." "Yet another wee project that I dabled with for a while Clock and What's Wrong With You." "But sure collaborations are great aren't they?. And here's another." "Out In The Fields two of my great heroes Gary Moore and Phil Lynott. Released in 1985 and quite probably Phil's last ever released recording." "Sticking with an Irish theme that was Rat Trap from Boomtown Rats. And now the only ever time I met Bob Geldof was when he walked into Def Leppard's dressing room when we were both playing Top Of The Pops sometime in the early 1990s. He walks right up to Joe Elliott and he says well he kind of called him a big girl's blouse. Now fortunately Joe has a great sense of humour so Bob does too apparently and that all works for me. Great stuff indeed." Note - This was in June 1992 when DL played 'Make Love Like A Man' on Top of The Pops and Bob introduced the show as a co-presenter with "And here's Def Leppard with Make Love Like a big girl's blouse". "So Sayonara as they say here in Japan. It's been a great great pleasure to bring you these shows and my very special thanks to everyone at BBC Radio Ulster and a very chap from the Beeb. Producer Rory McConnell for allowing me to waffle on the way I do. And who knows they might even have me back to do this again some time in the future. I closed out show number one with a track from Horslips and a story of a County Donegal summer holiday memory from some time in the early 1970s. And so I'll do so again now to book end these shows. From the 1974 album Dancehall Sweethearts this is Horslips King Of The Fairies. I'm Viv Campbell and I'll see ya anon."